There are 15 publications for Banking. This paper employs a Keynesian perspective to explain why Japanese government bonds’ (JGBs) nominal yields have been low for more than two decades. It deploys several vector error correction (VEC) models to estimate long-term government bond yields. It shows that the low short-term interest rate, induced by the Bank of Japan’s (BoJ) accommodative monetary policy, is mainly responsible for keeping long-term JGBs’ nominal yields exceptionally low for a protracted period. The results also demonstrate that higher government debt and deficit ratios do not exert upward pressure on JGBs’ nominal yields. These findings are relevant to ongoing policy debates in Japan and other advanced countries about government bond yields, fiscal sustainability, fiscal policy, functional finance, monetary policy, and financial stability. Have past and more recent regulatory changes contributed to increased financial stability in the European Union (EU), or have they improved the efficiency of individual banks and national financial systems within the EU? 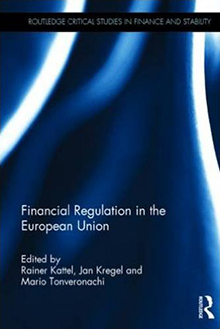 Edited by Rainer Kattel, Tallinn University of Technology, Director of Research Jan Kregel, and Mario Tonveronachi, University of Siena, this volume offers a comparative overview of how financial regulations have evolved in various European countries since the introduction of the single European market in 1986. The collection includes a number of country studies (France, Germany, Italy, Spain, Estonia, Hungary, Slovenia) that analyze the domestic financial regulatory structure at the beginning of the period, how the EU directives have been introduced into domestic legislation, and their impact on the financial structure of the economy. Other contributions examine regulatory changes in the UK and Nordic countries, and in postcrisis America. What Should Be Done with Greek Banks to Help the Country Return to a Path of Growth? The recapitalization of Greek banks is perhaps the most critical problem for the Greek state today. Despite direct cash infusions to Greek banks that have so far exceeded €45 billion, with corresponding guarantees of around €130 billion, credit expansion has failed to pick up. There are two obvious reasons for this failure: first, the massive exodus of deposits since 2010; and second, the continuous recession—mainly the product of strongly deflationary policies dictated by international lenders. Following the 2012–13 recapitalization, creditors allowed the old, now minority, shareholders and incumbent management (regardless of culpability) to retain effective control of the banks—a decision that did not conform to accepted international practices. Sitting on a ticking time bomb of nonperforming loans (NPLs), Greek banks, rather than adopting the measures necessary to restructure their portfolios, cut back sharply on lending, while the country’s economy continued to shrink. The obvious way to rehabilitate Greek banking following the new round of recapitalization scheduled for later this year is the establishment of a “bad bank” that can assume responsibility for the NPL workouts, manage the loans, and in some cases hold them to maturity and turn them around. This would allow Greek banks to make new and carefully underwritten loans, resulting in a much-needed expansion of the credit supply. Sound bank recapitalization with concurrent avoidance of any creditor bail-in could help the Greek banking sector return to financial health—and would be an effective first step in returning the country to the path of growth. 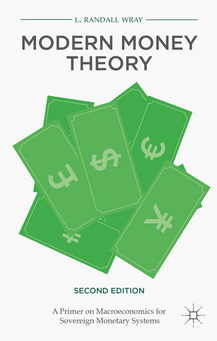 In a completely revised second edition, Senior Scholar L. Randall Wray presents the key principles of Modern Money Theory, exploring macro accounting, monetary and fiscal policy, currency regimes, and exchange rates in developed and developing nations. Wray examines how misunderstandings about the nature of money caused the recent global financial meltdown, and provides fresh ideas about how leaders should approach economic policy. This updated edition also includes new chapters on tax policies and inflation. This paper discusses the role that finance plays in promoting the capital development of the economy, with particular emphasis on the current situation of the United States and the United Kingdom. We define both “finance” and “capital development” very broadly. We begin with the observation that the financial system evolved over the postwar period, from one in which closely regulated and chartered commercial banks were dominant to one in which financial markets dominate the system. Over this period, the financial system grew rapidly relative to the nonfinancial sector, rising from about 10 percent of value added and a 10 percent share of corporate profits to 20 percent of value added and 40 percent of corporate profits in the United States. To a large degree, this was because finance, instead of financing the capital development of the economy, was financing itself. At the same time, the capital development of the economy suffered perceptibly. If we apply a broad definition—to include technological advances, rising labor productivity, public and private infrastructure, innovations, and the advance of human knowledge—the rate of growth of capacity has slowed. In this paper we will investigate financial reforms as well as other government policy that is necessary to promote the capital development of the economy, paying particular attention to increasing funding of the innovation process. For that reason, we will look not only to Minsky’s ideas on the financial system, but also to Schumpeter’s views on financing innovation. In this paper, I examine whether Hyman P. Minsky adopted an endogenous money approach in his early work—at the time that he was first developing his financial instability approach. In an earlier piece (Wray 1992), I closely examined Minsky’s published writings to support the argument that, from his earliest articles in 1957 to his 1986 book (as well as a handout he wrote in 1987 on “securitization”), he consistently held an endogenous money view. I’ll refer briefly to that published work. However, I will devote most of the discussion here to unpublished early manuscripts in the Minsky archive (Minsky 1959, 1960, 1970). These manuscripts demonstrate that in his early career Minsky had already developed a deep understanding of the nature of banking. In some respects, these unpublished pieces are better than his published work from that period (or even later periods) because he had stripped away some institutional details to focus more directly on the fundamentals. It will be clear from what follows that Minsky’s approach deviated substantially from the postwar “Keynesian” and “monetarist” viewpoints that started from a “deposit multiplier.” The 1970 paper, in particular, delineates how Minsky’s approach differs from the “Keynesian” view as presented in mainstream textbooks. Further, Minsky’s understanding of banking in those years appears to be much deeper than that displayed three or four decades later by much of the post-Keynesian endogenous-money literature. The crisis in Greece is persistent and ongoing. After six years of deepening recession, real GDP has shrunk by more than 25 percent, with total unemployment now standing at 27.2 percent. Clearly, reviving growth and creating jobs should be at the top of the policy agenda. But banks remain undercapitalized, and lending has been restricted to only the most creditworthy businesses and households. Many start-ups and small- and medium-size enterprises (SMEs) have almost no access to development loans, and for those to whom credit can be extended, it is at disproportionally high interest rates. The success of micro-lending institutions in developing nations (such as the Grameen Bank in Bangladesh) has highlighted the positive economic performance of community-based credit, and such lending models have proven to be an important poverty policy alternative in areas where transfer payments are limited. Community or co-operative financial institutions (CFIs) can fill the gap when existing institutions cannot adequately perform critical functions of the financial system for SMEs, entrepreneurs, and low-income residents seeking modest financing and other banking services. We propose expanding the reach and services of CFIs within Greece, drawing upon lessons from the US experience of community development banking and various co-operative banking models in Europe. The primary goals of this nationwide system would be to make credit available, process payments, and offer savings opportunities to communities not well served by the major commercial Greek banks. Our blueprint includes suggestions on the banks’ organization and a framework within which they would be chartered, regulated, and supervised by a newly created central co-operative bank. It also looks at the possible impact that such a network could have, especially in terms of start-ups, SMEs, and rural redevelopment (agrotourism)—all of which are critical to Greece’s exit from recession. With the full effects of the Great Recession still unfolding, this collection of essays analyzes the gendered economic impacts of the crisis. The volume, from an international set of contributors, argues that gender-differentiated economic roles and responsibilities within households and markets can potentially influence the ways in which men and women are affected in times of economic crisis. Looking at the economy through a gender lens, the contributors investigate the antecedents and consequences of the ongoing crisis as well as the recovery policies adopted in selected countries. There are case studies devoted to Latin America, transition economies, China, India, South Africa, Turkey, and the United States. Topics examined include unemployment, the job-creation potential of fiscal expansion, the behavioral response of individuals whose households have experienced loss of income, social protection initiatives, food security and the environment, shedding of jobs in export-led sectors, and lessons learned thus far. From these timely contributions, students, scholars, and policymakers are certain to better understand the theoretical and empirical linkages between gender equality and macroeconomic policy in times of crisis. This paper presents a small macroeconomic model describing the main mechanisms of the process of credit creation by the private banking system. The model is composed of a core unit—where the dynamics of income, credit, and aggregate demand are determined—and a set of sectoral accounts that ensure its stock-flow consistency. In order to grasp the role of credit and banks in the functioning of the economic system, we make an explicit distinction between planned and realized variables, thanks to which, while maintaining the ex-post accounting consistency, we are able to introduce an ex-ante wedge between current aggregate income and planned expenditure. Private banks are the only economic agents capable of filling this gap through the creation of new credit. Through the use of numerical simulation, we discuss the link between credit creation and the expansion of economic activity, also contributing to a recent academic debate on the relation between income, debt, and aggregate demand. In March of this year, the government of Cyprus, in response to a banking crisis and as part of a negotiation to secure emergency financial support for its financial system from the European Union (EU) and International Monetary Fund (IMF), proposed the assessment of a tax on bank deposits, including a levy (later dropped from the final plan) on insured demand deposits below the 100,000 euro insurance threshold. An understanding of banks’ dual operations and of the relationship between two types of deposits—deposits of customers’ currency and coin, and deposit accounts created by bank loans—helps clarify some of the problems with the Cypriot deposit tax, while illuminating both the purposes and limitations of deposit insurance. In the aftermath of the global financial collapse that began in 2007, governments around the world have responded with reform. The outlines of Basel III have been announced, although some have already dismissed its reform agenda as being too little (and too late!). Like the proposed reforms in the United States, it is argued, Basel III would not have prevented the financial crisis even if it had been in place. The problem is that the architects of reform are working around the edges, taking current bank activities as somehow appropriate and trying to eliminate only the worst excesses of the 2000s. Hyman Minsky would not be impressed. Before we can reform the financial system, we need to understand what the financial system does—or, better, what it should do. To put it as simply as possible, Minsky always insisted that the proper role of the financial system is to promote the “capital development” of the economy. By this he did not simply mean that banks should finance investment in physical capital. Rather, he was concerned with creating a financial structure that would be conducive to economic development to improve living standards, broadly defined. In this paper, we first examine Minsky’s general proposals for reform of the economy—how to restore stable growth that promotes job creation and rising living standards. We then turn to his proposals for financial reform. We will focus on his writing in the early 1990s, when he was engaged in a project at the Levy Economics Institute on reconstituting the financial system (Minsky 1992a, 1992b, 1993, 1996). As part of that project, he offered his insights on the fundamental functions of a financial system. These thoughts lead quite naturally to a critique of the financial practices that precipitated the global financial crisis, and offer a path toward thorough-going reform. Before we can reform the financial system, we need to understand what banks do—or, better yet, what banks should do. Senior Scholar L. Randall Wray examines Hyman Minsky’s views on banking and the proper role of the financial system—not simply to finance investment in physical capital but to promote the “capital development” of the economy as a whole and the improvement of living standards, broadly defined. This would seem an opportune moment to reshape banking systems in the Americas. But any effort to rethink and improve banking must acknowledge three major barriers. The first is a crisis of vision: there has been too little consideration of what kind of banking system would work best for national economies in the Americas. The other two constraints are structural. Banking systems in Mexico and the rest of Latin America face a financial regulation trilemma, the logic and implications of which are similar to those of smaller nations’ macroeconomic policy trilemma. The ability of these nations to impose rules that would pull banking systems in the direction of being more socially productive and economically functional is constrained both by regional economic compacts (in the case of Mexico, NAFTA) and by having a large share of the domestic banking market operated by multinational banks. For the United States, the structural problem involves the huge divide between Wall Street megabanks and the remainder of the US banking system. The ambitions, modes of operation, and economic effects of these two different elements of US banking are quite different. The success, if not survival, of one element depends on the creation of a regulatory atmosphere and set of enabling federal government subsidies or supports that is inconsistent with the success, or survival, of the other element. A year and a half after the collapse in the financial markets, the debate about necessary “reforms” is still in its early stages, and none of the debaters seriously claims that his solution will in fact prevent a new crisis. The problem is that the proposed remedies deal with superficial matters of industrial organization and regulatory procedure, while the real problems—outsized, ungovernable financial firms and rampant securitization—lie on a more profound level. This paper is concerned with the New Consensus Macroeconomics (NCM) in the case of an open economy. It outlines and explains briefly the main elements of and way of thinking about the macroeconomy from the standpoint of both its theoretical and its policy dimensions. There are a few problems with this particular theoretical framework. We focus here on two important aspects closely related to NCM: the absence of banks and monetary aggregates from this theoretical framework, and the way the notion of the “equilibrium real rate of interest” is utilized by the same framework. The analysis is critical of NCM from a Keynesian perspective. © 1986 – 2019 Levy Economics Institute.